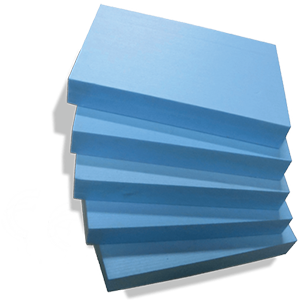 Extruded polystyrene insulated boards for roof, cavity walls and floor application. Our range of products are manufactured to comply to the requirements of ASTM C-578-95 and BS EN 13164:2012+A1:2015. Insulation system reduces the heat transfer through the envelope of a building. Extruded polystyrene boards have closed cells with common sides and is produced with fully automated extrusion process in accordance with international specifications and standards. Extruded polystyrene has a high resistance to water absorption. The manufacturing process, combined with intrinsic qualities of the static component thermoplastic material gives it predictable performance and high insulating value. Roof Insulation mostly known as the inverted roof concept or upside-down roofing, succeeds in insulating both the waterproofing membrane and the slab from extreme thermal stress. Interior Wall Insulation : It is used where existing buildings require insulation, building with special exterior finishes and building with intermittent air conditioning. The Internal lining (Wall fix) can be used either with adhesives or by mechanical fasteners. Cavity Wall Insulation – It is is an advantage where an external brick of any type and finish is required. Also, for any type for air conditioned buildings or GRC panels with adhesive or mechanical fasteners. Exterior Insulation - It is most efficient way of insulating buildings without interrupting structure elements. It can be fixed behind granite or GRC panels with adhesive or mechanical fasteners. Floor finish is particularly important in the hot weather areas, especially where the soil temperature is very high. Good floor insulation helps reduce heat flow through the floor into air conditioned buildings. Extruded Polystyrene boards are efficient due to their high compressive strength, high resistance to water absorption, moisture penetration and low thermal conductivity. • Very high resistance to water absorption. • Does not require a vapor barrier. • Not affected by cavity masonry wall construction. • High long-term insulation value. • Protects the inner walls from condensation. • Easy to handle, cut and install. • The boards are specially long to help cover more areas and therefore reduce installation time and cost. • Available in a wide range of thicknesses. • It has Tongue and Groove profiles on all four edges to eliminate thermal bridging. • It does not rot or settle. • It is extremely cost-effective in cavity wall applications. • If the concrete deck surface is rough, it is advisable to install a protection sheet underneath the membrane. • The membrane shall be free of solvents which could attack extruded polystyrene foam. • The waterproofing membranes shall be of good quality. 35, 26 or 21 RF insulation boards shall be laid loose over the membrane, with tight staggered joints. Paving slabs or gravel shall be laid loose over 35,26 or 21 RF to protect it from wind uplift, buoyancy and UV radiation. In the case of gravel, gravel sizes of 15-30 mm in diameter shall be used and the gravel layer depth shall be a minimum of 50 mm. 21 CW offers all the advantages of extruded polystyrene insulation at a substantially lower cost, making it highly cost-effective and lower in density. • It does not require a vapour barrier. 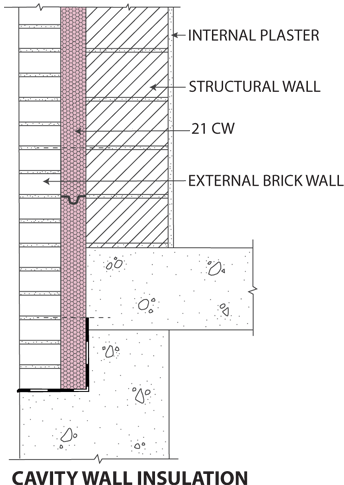 • It is not affected by cavity masonry wall construction.